A set of stamps depicting China's ancient national symbol Dragon has created a controversy and furore in China. 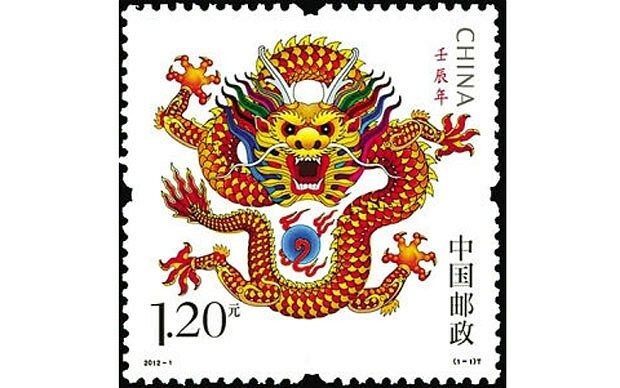 Chinese have reacted angrily to a special edition stamp to celebrate the Year of the Dragon to be celebrated later this month. "The dragon on the stamp looks too ferocious," says one blogger, while some foreign observers say that it is perhaps officially backed to covey a strong message about China's rise. However, Cchen Shaohua, the designer of the new stamp, defended it saying the image of the dragon should not be too gentle because it would clash with the mental image most Chinese have of the creature. "The dragon is the deity of the 12 animals of the Chinese Zodiac, and you can't modernise the creature like a cartoon," official Xinhua news agency quoted Chen, who designed the emblem for 2008 Olympic Games, as saying. The first set of dragon stamps, issued in 1988, abandoned the awe-inspiring look of the legendary creature and used the style of Chinese traditional paper-cutting art to tone down its appearance. Despite the furore, the sellers at a philatelic market in Beijing were reporting bumper pre-sale orders, with eager collectors paying up to £18 for a commemorative pack of the 12 penny stamps which went on sale on Thursday, 5 Jan 2012, reports The Telegraph.